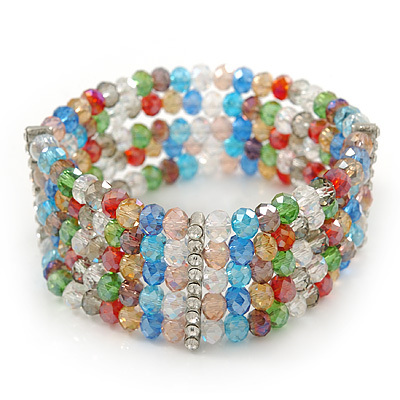 Complete your look with this fancy 5 Strand Multicoloured Glass Bead Flex Bracelet With Crystal Bars. Featuring a multistrand flex design, made of multicoloured glass beads and decorated with three evenly spaced crystal metal bars. The stretch fit lends convenience to your accessorizing routine. Fits up to 20cm. Width about 3cm.